Through sensitive, sometimes humorous, experienced-based writing from teachers, clinicians, and parent activists in the Autism Spectrum Disorder (ASD) community, this book will help educators and others to better understand the world inhabited by ASD children. The stories contained in the book will inspire and inform readers who are working day-to-day with children in the autism spectrum, providing valuable insights into what makes these kids tick and useful information on how they communicate, learn, and succeed. 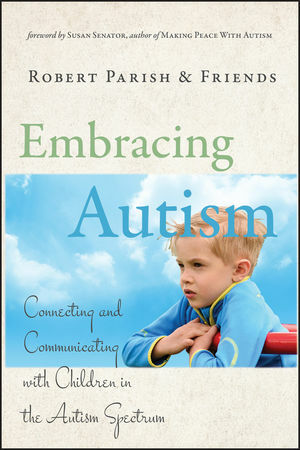 Robert Parish (Cincinnati, OH) is an award-winning journalist with four nationally broadcast public TV documentaries about Autism Spectrum Disorders to his credit, as well as more than 100 digital video projects about ASD for the educational market. Robert Parish is an award-winning journalist with four nationally broadcast public TV documentaries about autism spectrum disorders to his credit. He has produced more than one hundred digital video projects about ASD for educational distribution and hosts a bimonthly program on Autism One Radio (www.autismone.org). Parish's son Jack has been an inspiration to him, his family, and many others. Thousands visit his educational website each month at www.comebackjack.org. Foreword: The "Secret" Key to Connection (Susan Senator). Chapter 1. My Journey with Jacob (Diane Bayer). Chapter 2. Relating to ASD Children (Arnold Miller). Chapter 3. Three Special Kids-No Apologies Necessary (Kim Stagliano). Chapter 4. Patience-The Least Important "Super Power" ( Kristin Kaifas-Tennyson). Chapter 5. North of the Border (Gay and Dennis Debbaudt). Chapter 6. Getting to Know You (Stephen Shore). Chapter 7. Life with Shawn (Jeanne Lyons). Chapter 8. The Freedom to Be Odd (Cammie McGovern). Chapter 9. Just a Little Autism (Teresa Becerra). Chapter 10. Acceptance in Waves (Robert Becerra). Chapter 11. Everyone Has a Chance to Grow (Jackie Marquette). Chapter 12. Grass in the Wind (Kristina Chew). Chapter 13. Now for Our Feature Presentation (Robert Parish). Chapter 14. The Big Question. • Hot topic: ASD is the fastest-growing developmental disability, with diagnoses increasing 10-17% annually. It affects as many as 1 in 150 children in the United States. Consequently, there is an enormous amount of interest in this topic. • Author platform: Parish is a well-known and respected figure in the ASD community. He speaks to thousands of educators per year through his regular conference presentations, maintains a web site (comebackjack.org) which receives roughly 5,000 unique visitors per month, and is frequently interviewed in the media as an expert on autism. His latest documantary on autism will be released in Spring 2008. • Provides valuable information: The inspirational stories contained in this book will provide educators with key insights into what makes these children tick and valuable information on how they communicate, learn, and succeed. • Strong contributor list: The contributors to this book—including Stephen Shore, Susan Senator, Jeanne Lyons, and Arnold Miller—reach tens of thousands per year through speaking engagements, school workshops, media interviews, and writing for mainstream and professional publications, web sites, and blogs.